Home » What doll should I buy for my child? What doll should I buy for my child? A doll is a small copy of a human being. The doll helps the child to adapt to the world that surrounds him or her. Each doll contains information about a certain lifestyle. While playing with a doll, a child is learning to build up relationships with other people and is living through different life situations. Do you want your child to see the world in a distorted manner? No? Do you value beauty and aesthetics? Do you want to implant good taste in your child? Very often we are guided by fashion. We look at the toys that our neighbours buy to their children. Our choices are enforced on us by advertisement that is constantly broadcast on TV. In the result, our child ends up playing with a monster-toy which has long vampire teeth, rolling eyes, and disproportionate body. What might a toy like that teach a child? What taste can it implant? What emotions and feelings can it arouse? Will it become the child's best friend? Don't rush to buy any doll, just the first one you see. Think about what benefit or harm such toy can bring to your child. Stop flushing money down the drain. Remember that a child might identify himself or herself with a doll, and it can become a conductor or his or her mental state. Paola Reina dolls bring out the best in any child, create positive emotions: smile, happiness, tenderness, wish to care about somebody. 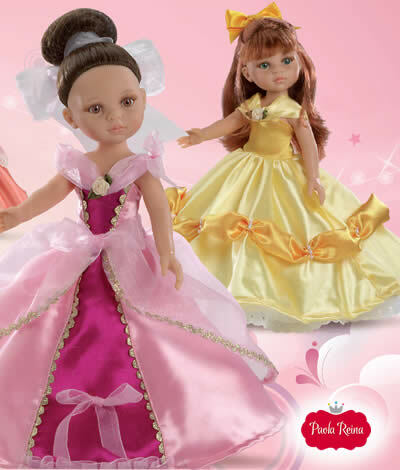 The beauty, natural and expressive features of Paola Reina dolls will not leave your child indifferent. These dolls are made for little princesses and ladies. Bring up a lady in your little girl! Everything starts from the childhood – the best and the worst. We wish you to make the right choice and decision!